World Campus International’s Japan Program offers young adults the chance to view Japan’s culture, people, and language from within! 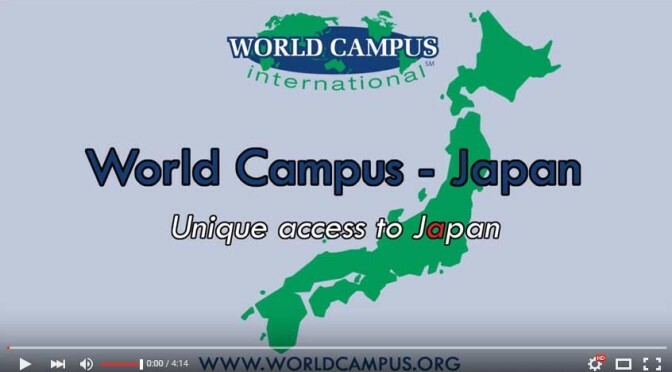 World Campus International, Inc. is a nonprofit organization that provides a unique access to Japan. As a participant of the of the World Campus – Japan (WCJ) Program you will be part of an international group that travels around Japan. 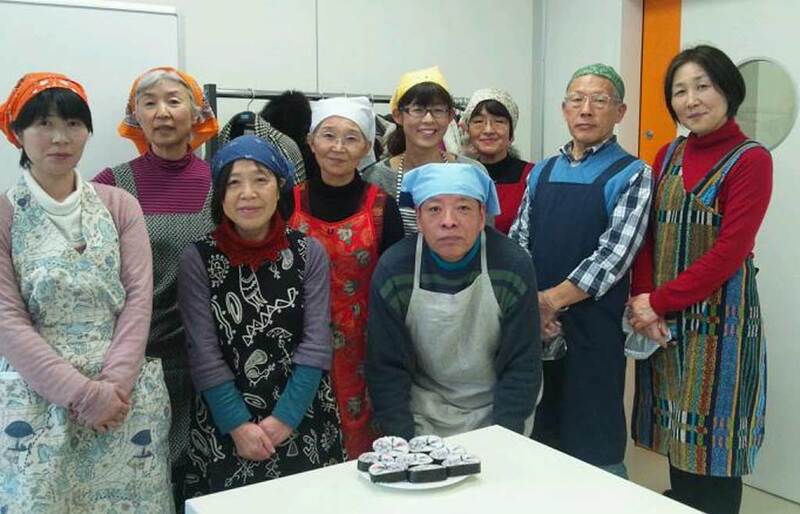 During the day there are various activities in which you interact with the local community and learn about Japan and the world. In the evening and at night you will be with your host-family. This way you get the chance to experience Japan from an inside perspective. This year there will be three sessions. The duration of one session is three weeks. During that time we visit three or four cities. You can choose in which session you would like to participate or if you want to join one, two or all of the sessions. Welcome to Tama City in World Campus – Japan 2015!!! We are World Campus – Tama, the community partner of World Campus International. We have been hosting the group of people from World Campus International since 2007, and some of you will be visiting Tama city as the final stop of the upcoming World Campus – Japan program. Now we’re planning some exciting activities for you! First of all, you’ll be visiting the national diet building of Japan on your way to Tama city. Last summer, we visited there as one of the activities for the first time and it was an amazing experience for all of us! During your stay in Tama, you’ll have a great opportunity to interact with some local people such as the middle age citizens from Tokyo, students from Tama University, and students from Keisen Jogakuin University! Some of the students will be taking you to downtown Tokyo on your personal day! And it’s going to be the 4th time to hold the event, called “Sekai no hiroba”. We’ll be welcoming the local people of Tama city and sharing our cultures each other, and also having an “Arigato event” as a part of that big event. We’re having fun preparing for the summer! It’s going to be short one week, but we’re so excited to have all of you here in Tama! 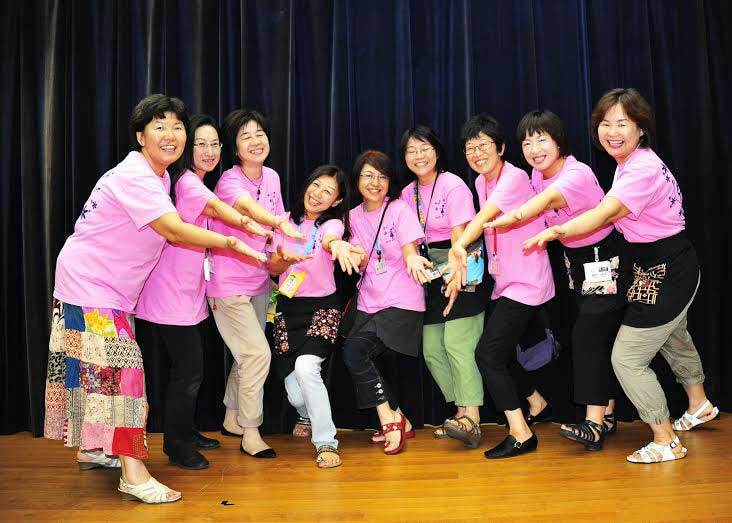 Welcome to Abiko City in World Campus – Japan 2015!!! Abiko city has rich nature and is located in such a convenient area that takes to 40 minutes both to the center of Tokyo and to Narita airport by train. The population is about 140,000 and Abiko is very popular as a bed-town of Tokyo. People are extremely kind and a bit shy. You can enjoy traditional performing art, Kagura, which have been handed down since Edo period. We are looking forward to having you here in country town with full of human warmth, Abiko! 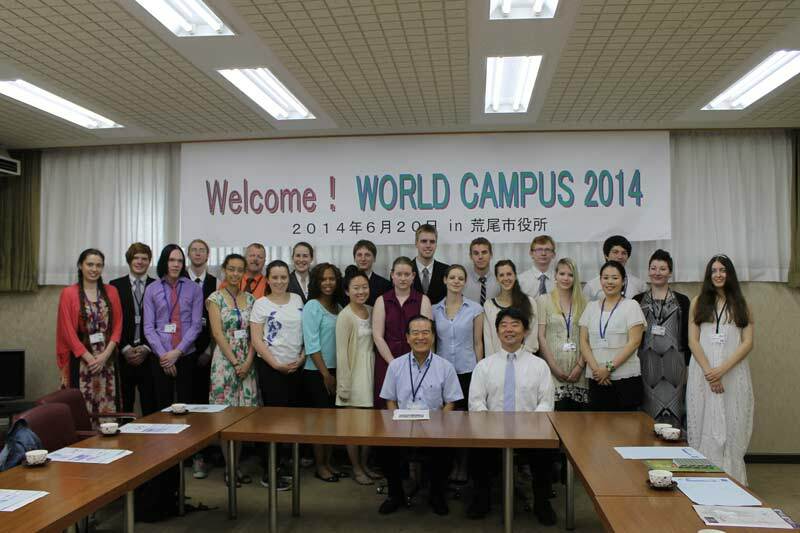 Welcome to Toride City in World Campus – Japan 2015!!! Even though it takes only 40 minutes to get to the center of Tokyo, there is rich nature in Toride city such as the Tone River, one of the largest rivers in Japan! And there is an art college in this city, so Toride is known as a city of art as well! We have several activities for the World Campus – Japan program 2015, and “Flying kites” activity would be the most exciting part of your stay in Toride! We are going to make 40 kites with the host families and let them fly in the sky by the Tone River! Also we’re planning to have some more experiences of Japanese traditional cultures! Welcome to Toride! We all look forward to meeting you! Today was the most eventful day so far. From early in the morning we were dressed in our best outfits to meet the mayor of Arao city, Mr. Maebata. He gave us a general introduction to the geography and history of the area. We learned that Arao was once a prosperous coal mining town whose main mine, the Manda coal mine, had ceased its ore extraction operations in 1951. The amusement park “greenland”, whose ferris wheel towers over the city, made its obligatory cameo, and with the city pushing for the Manda coal mine’s acceptance as a UNESCO world heritage site, and Arao’s numerous natural tourist attractions, like the Arao tideland and wetlands, the Mayor revealed ambitions of a booming tourism industry in the area. After Mr. Maebata finished his address, he opened for a Q&A session, and we were allowed to ask him about both business and leisure. This was a unique opportunity to gain an impression of Japanese politics at the city level. 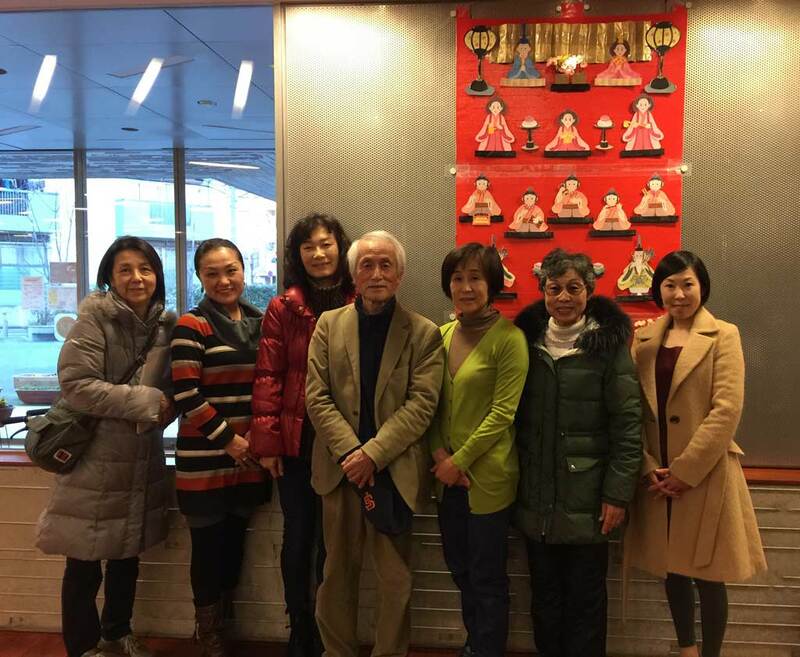 Unless you know enough Japanese to read a newspaper or follow the news on television, foreigners are usually only exposed to politics at the national level, so this was a valuable opportunity. 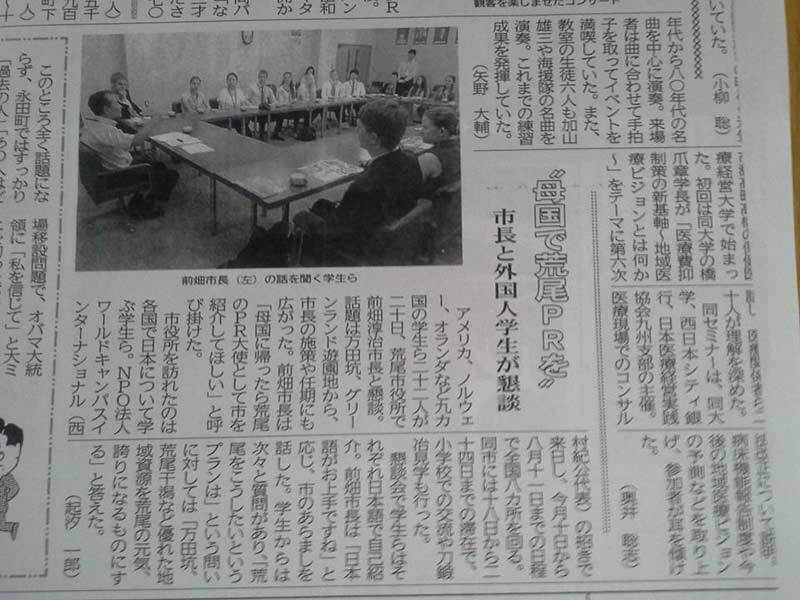 A few days later our visit was featured in the Ariake Shinpo, the local newspaper for the Omuta and Arao area.